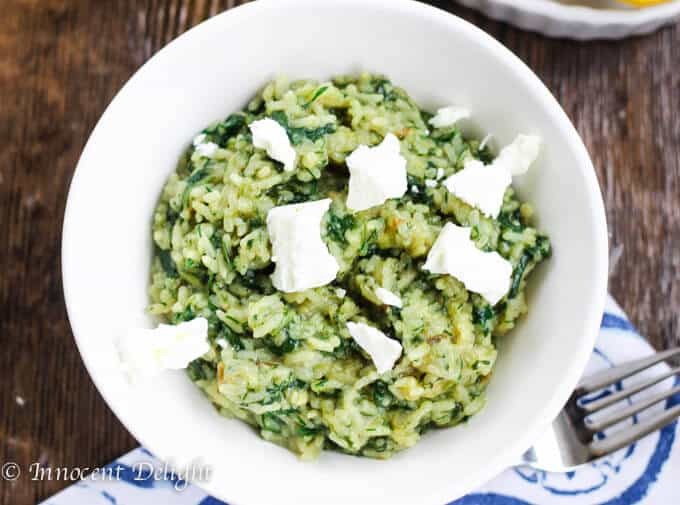 This Greek Spinach Rice also known as ‘Spanakorizo,’ is perhaps one of the most popular, healthy, traditional and authentic of Greek dishes. 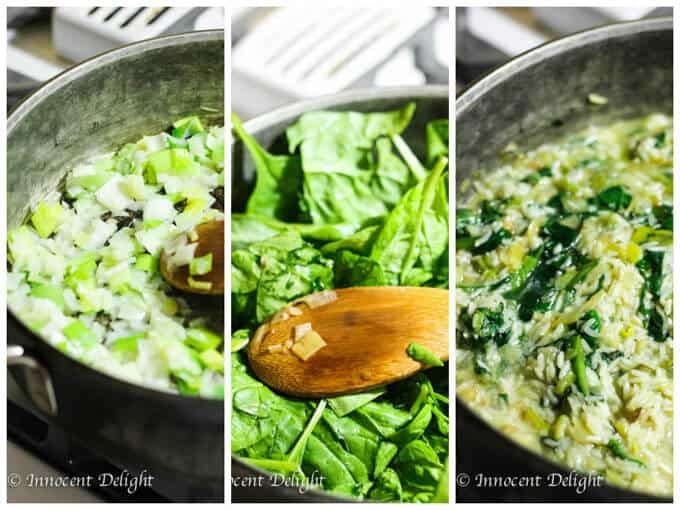 It has a soft and creamy texture with an abundance of nutrients from the cooked spinach, fresh herbs, lemon juice and extra virgin olive oil. 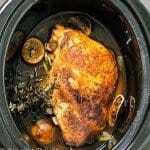 It can be served as a main dish or as a side dish to any of your favorite meats or fish. Also, you can go vegan with it, if you nix the feta, or vegetarian with its delicious salty feta cheese. This is a great Greek recipe is absolutely one of my favorites! I originally got from my close friend Marta, who had it passed down from her Greek Family (thanks, Marta). 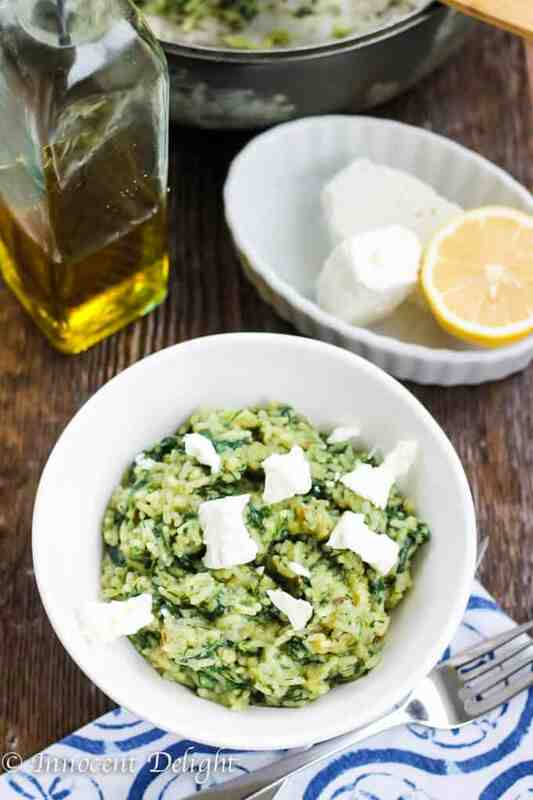 So as you can see, this spinach and rice recipe comes straight from Greece and is simply delicious. Ever since I recreated it for the first time, it seems to find its way to our menu at least once a week. It really is that good!!! Even my husband, who isn’t much of a spinach fan, likes this dish. Not to mention, my 2 little kiddos even shovel it down by the pound. It’s a fantastic way to add some green veggies into your loved ones’ diet. You’ll need to add pretty significant amount of spinach to it, but because it wilts, you cannot really say that there’s too many greens in this rice. 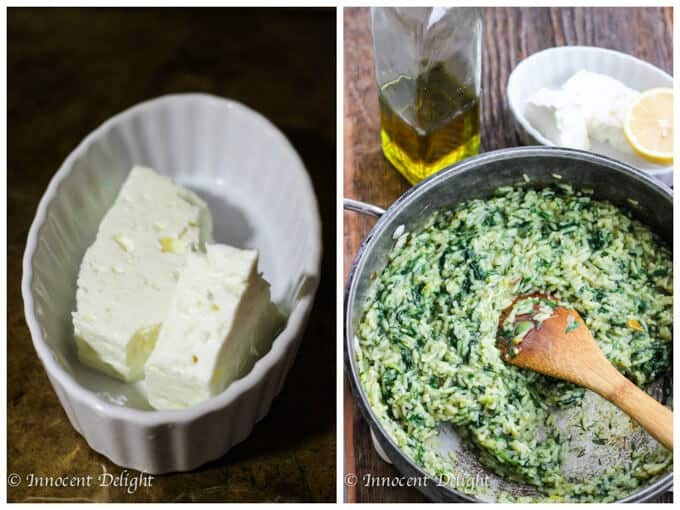 Traditionally this Greek rice pilaf is served during winter months, but don’t constrain yourself – anytime you have an abundance of Spinach you can make it and enjoy it year round. As my friend Marta would tell you, you shouldn’t rush it. It’s not one of those dishes that you just throw in a pot and forget about. Rather, you’ll need to nurture it along the way; but it is totally worth it. It should take about 45 minutes to prepare it, from beginning to the end, and it will require some stirring along the way, like with a risotto. Serve with some additional lemon juice, olive oil and Feta Cheese on top. The concept of this Greek rice is actually very similar to an Italian risotto. Traditionally Italians use Arborio rice, whereas the Greeks would use a medium or long grain rice for their rice pilaf. However, frankly I think that you can use any rice you have. I usually have Thai Jasmin rice in my house, but recently I bought Organic Indian Basmati from Trader’s Joe and it works well for this recipe too. Now, I assume it doesn’t come as surprise that Chinese eat the most rice in the world – over 4 pounds of uncooked rice per person each week. Obviously it’s a staple in other Asian countries as well. However, it may come as a surprise that it is pretty popular in Mediterranean countries too. In Greece the most popular type is long grain rice. 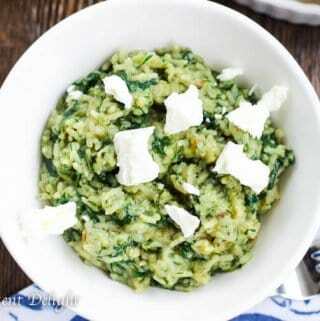 It’s used in different kinds of pilafs, like this one with Greek Spinach Rice. What is interesting is that brown rice was never dominant in either Asian or Mediterranean cuisines. Meanwhile, we’ve been led to believe that brown rice has superior nutritional values over white rice. In light of recent discoveries of the traces of arsenic in rice however, especially in the outer layer that white rice has stripped off, it seems like the Asians and Mediterraneans may have been onto something with the white rice…go figure. How long it will take us to discover it and trust those who’ve been eating rice for centuries? Long story short, my advise for this Greek rice recipe is to use white rice, as the Greeks do. But it you’re a brown rice enthusiast, wondering if it’d work for this recipe…I’d say, yes (it’s personal preference). However, bear in mind that brown rice cooks much longer then white rice and you may end up having really overcooked spinach. There are number of ways you could serve this spinach rice. As a side dish to any of your meat or fish dishes. If you’re looking for suggestions, these Mediterranean Chicken Kebabs or Pan Fried Haddock Mediterranean Style would work perfectly. If your looking for total emersion, then after dinner you can serve this Greek Frappe Coffee with your dessert. It’s so good! This a version is considered the “white Spanakorizo,” but there’s also a “red Spanakorizo” version which would have chopped tomatoes added. It reheats perfectly (either in microwave, with a splash of water, or on the stove, with a bit of liquid as well), so you can easily use it the next day for lunch or dinner. But, the perfect way to use up these spinach rice leftovers is to stuff it with either peppers or tomatoes and bake in the oven until the veggies are cooked through. Is Greek Spinach Rice Healthy? Rice is a good source of carbohydrates. And because of the above, I make it a point to serve it to my family at least once a week. Believe it or not my pickiest eater, my 5 year old, actually requests it! 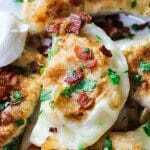 Try this awesome recipe and let me know how your loved once reacted (I’m very curious). 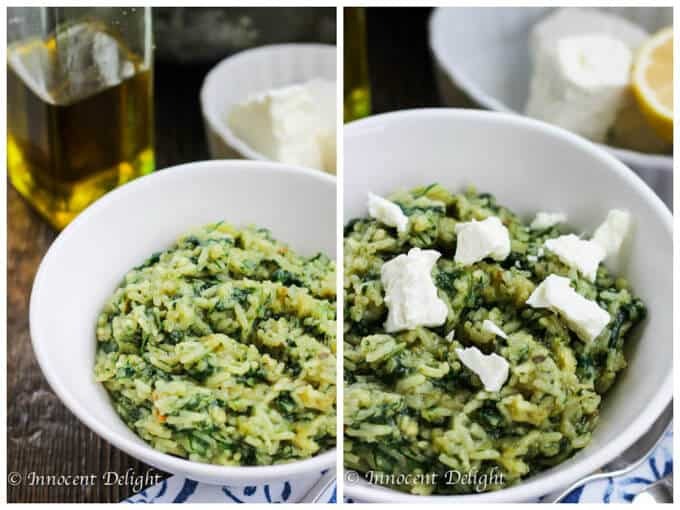 This Greek Spinach Rice also known as Spanakorizo is one of the most popular and healthy traditional and authentic Greek dishes. It has soft and creamy texture with abundance of nutrients coming from cooked spinach, fresh herbs, lemon juice and extra virgin olive oil. 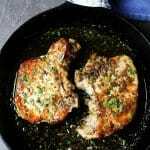 It can be served as main dish or side dish to any of your favorite meats or fish. It can be vegan without feta or vegetarian with delicious salty feta cheese. When serving, sprinkle more lemon juice, olive oil and top it with Feta Cheese. Enjoy! You can also serve feta on a side instead of the top of the rice. I know some people prefer it this way. I ‘m always looking for ways to feed my husband spinach . For him to eat it it has to be hidden and this recipe does that. A great post and great pictures. This looks great Edyta – one I will definitely try! Just made this and got a, “Wow, this is great!” from my husband who finished off what I thought would be the leftovers. Followed by a, “You are going to make this again, right?” comment. I may have to make this again in a few days. I made it with Jasmine rice and a mixture of baby spinach, baby kale & baby bok choy that I pickeded up accident thinking it was all baby spinach. Still AWESOME! Thank you for sharing this. Looking forward to next recipe! I made this dish on Sunday and it was a show stopper! The best part was my 4 year old and 1 year old loved it! This look so yammii. If we are kind of having this as a main. How many people would this serve please? Hi Hana, this recipe calls for one cup of uncooked rice which would make approximately 3 cups of cooked rice. If you’re serving it as a main dish with one cup of rice per person, that would make 3 servings. If you need more, just add more rice and you will be fine.